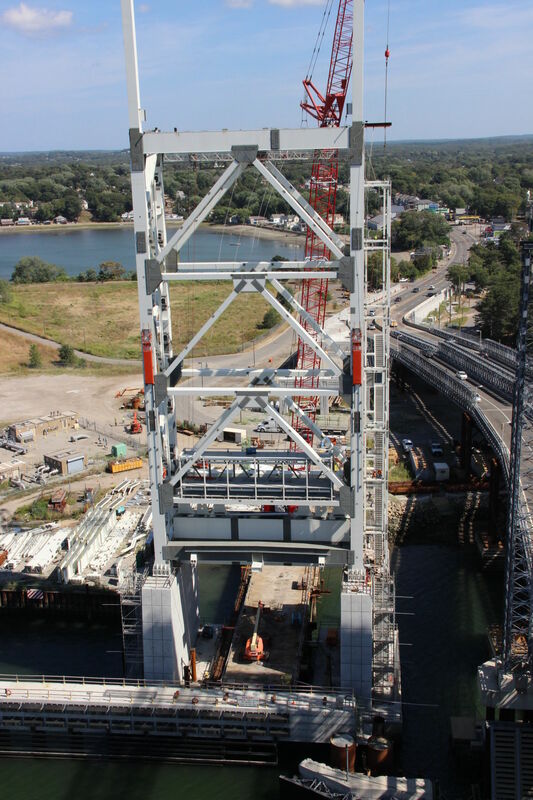 A look at Weymouth Fore River bridge replacement project in Massachusetts. The designer in the successful D-B team becomes the designer of record, completing development of the bridging plans and specifications with levels of effort necessary to construct the project, and providing as-built drawings for retention by the owner. The design-build plans and specifications are submitted for review and approval by the owner. These tend to be more streamlined than design-bid-build documents because they do not contain bidding information and because they are supplemented by work plans, catalog cuts, and shop drawings. Agencies may receive, but should avoid, approving shop drawings. Division 01 General Requirement specifications modify the contract so they may be prepared as part of the bridging documents, but should not be allowed in design submittals. Agencies often hire consultants to review design-build design submittals, but it is important to ensure these consultants have no conflicts of interest. In some cases, consultants can generate higher fees for themselves by objecting to unimportant and unnecessary design issues. This delays the project and costs all parties (except for them). Terminology should be consistent across the bridging documents and with the contract/legal terminology to the furthest extent possible. A best practice is to make a list of terminology to be used on a project, and seek owner approval as early as possible. Once the terminology is approved, it should be circulated to all bridging team members, periodically reviewed and updated. All bridging documents must be checked to ensure consistent wording. As always, the Project Resource Manual CSI Manual of Practice offers sage advice when it comes to writing style and organization. One should use a clear, concise, and consistent style, and eliminate unnecessary words. Bridging documents are prepared by a large group of professionals with varying styles. It is beneficial to prepare and distribute templates with guidance on writing style before embarking on document preparation. Bridging documents should be organized using the owner’s standard table of contents. If the owner does not have a standard table of contents, MasterFormat and UniFormat are widely used effective tools for organizing the bridging document information. Bids are mostly lump sum. Multiple lump sums can identify bid costs for various portions or phases of the project. Sometimes, unit prices are included to shift quantity risk. If multiple lump sums and/or unit prices are used, payment items must be defined. For unit prices, the method of measuring the units must be included. To be ‘bidable,’ the bridging documents must be technically correct and the baseline design must be able to be completed and constructed within the project duration. If the bridging documents are not bidable, the D-B proposers will not bid the project, or may put high-risk premiums on it, driving up the project cost to the owner. As this three-part series has shown, bridging document preparation should focus on project definition, risk allocation, defining the procurement/selection process. Best practices should be followed. The bridging team must work closely with the owner to determine and convey the project objectives. It must be sufficiently flexible to incorporate project changes and bidder feedback, and to evaluate alternates. During the design-build phase, the bridging team must be ready to supplement owner personnel so timely and informed decisions can be made to facilitate the D-B process. Robert Connors, PE, CCS, has more than 25 years of experience in engineering and management. He has a varied project portfolio that includes buildings, bridges, rail, wind turbines, and maintenance facilities. Connors specializes in procurement documents, project management, construction cost estimating, cost accounting, scheduling, claims analysis, finance, and contract administration. A certified construction specifier, he is also past treasurer of the Design-Build Institute of America’s (DBIA’s) New England Region. He can be reached at robert.connors@stvinc.com.